Two posts in two days? Yep, the boys are in camp this week, so I actually got to sew today. And take sculpt and cardio funk classes at the Y. And shower without having to run out in the middle to take care of some urgent thing the boys need or are fighting about. Give me 4.5 hours and I can get a whole lot finished. 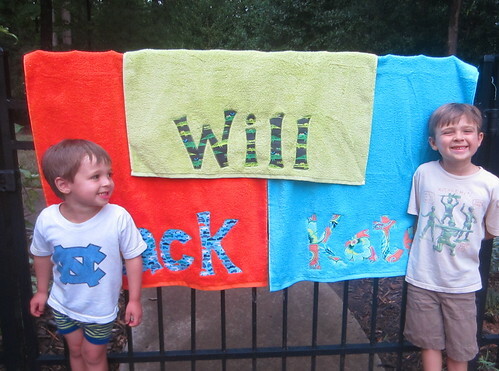 I bought the boys personalized beach towels from pottery barn kids about 2-3 years ago and the things have taken a beating. Andrew wiped a wet picnic table at the Y pool with Jack's and then we realized they must have just sprayed it down with bleach. It immediately discolored and ate away at the fabric. So we definitely needed new ones, and I like the convenience of having their names on them, so I used the same method in my tutorial here, just on a bigger scale. I also made a couple for our camper friends, Kate and Olivia. They are letting us borrow light sabres for an epic Star Wars battle to be fought on our cul-de-sac this week. The boys are even making posters to advertise this event. Will (age 3) told me it "is the final battle between good and evil." Great. In any case, you can see how we are indebted to them. I was not willing to spend $40 on a pair of light sabres for two boys who don't really like Star Wars but just needed them for this battle thing. For about two minutes I thought about selling these on etsy, but a quick search revealed that a lot of other people have had this same idea. Nevermind. I always prefer to sell the ready made stuff on etsy; seems like custom orders always come in at the craziest points in my life and they just weigh heavy on me until I get them mailed out! I also made a pretty cool project this weekend. I pinned it to my Education Pinterest Board last week and hurried to get the supplies together. The idea is from one of my favorite blogs/books - Playful Learning. They have uppercase letters on one side and lowercase on the reverse. I did not use stencils, mainly because I could not find any in a font that remotely resembled how handwriting should look. Instead I just went free hand with the chalkboard paint. 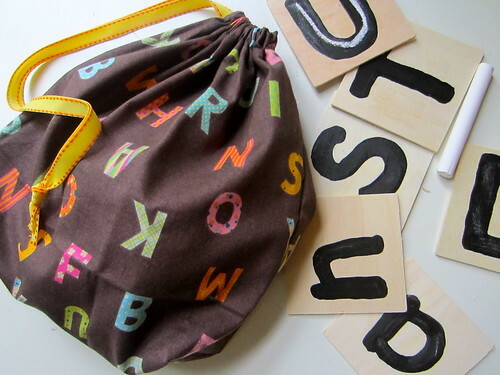 Then I made a little drawstring bag, using my tutorial here. My boys are not too hot on practicing writing, so I try to use any fun way I see to get them working. They immediately sat down, split up the letters and each did half of the alphabet both sides. Totally worth the effort! 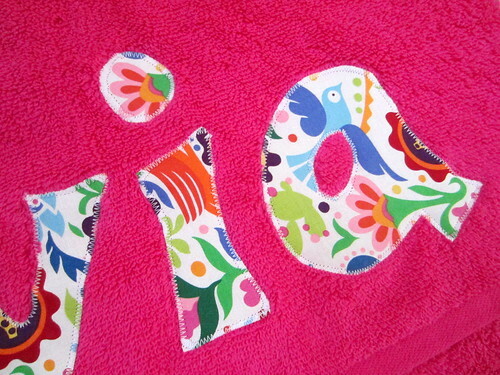 Great job on all of these.. Those towels look awesome and the letters are a great idea! 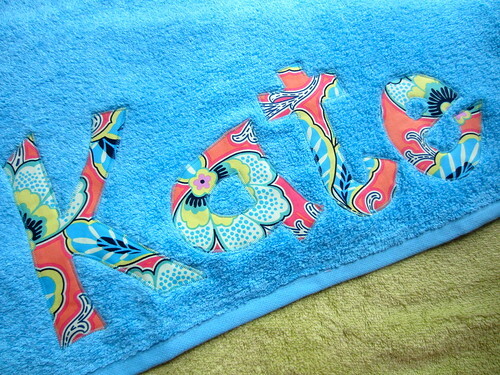 Very cute towels and love the handwriting cards! I have get a lot of useful information and fresh knowledge from your blog or site. 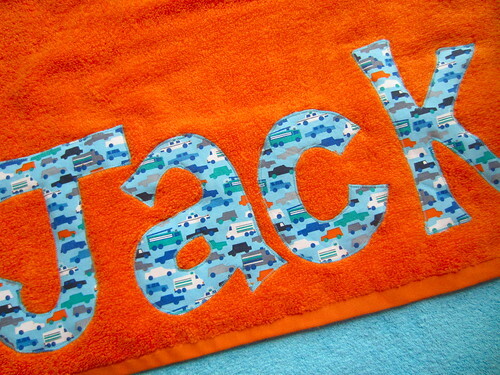 personalized beach towels. Thanks for nice posting plzease update this blog. Thanks for your content and I will go back again soon because this blog or site is so interesting to give us knowledge. Personalized Water Globes Thanks for very nice content.